As one of the leading manufacturer’s of conveyor modules with proven build quality and reliability, we are proud to present UNI-FLEX™ – a range of expandable, flexible and durable conveyors for loose loading and unloading applications. Loose loading eliminates “dead space” created by pallets or roll-cages. Designed to endure the rigorous demands of Distribution Centres and parcel handling hubs around the world, UNI-FLEX™ conveyors will provide cost effective handling solutions – not only for the large distribution centres but also for smaller companies requiring only single units. 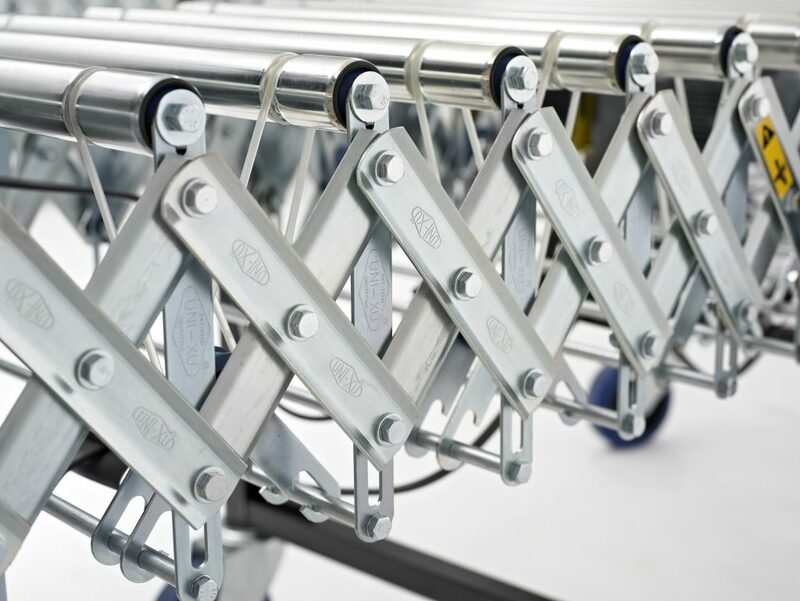 UNI-FLEX™ expandable conveyors are engineered to the highest standards with reinforced ribbed, zinc plated steel side plates for additional strength, structural support across the width and heavy duty square tubing legs to ensure total stability. These conveyors are extremely flexible and are easily manoeuvred into position on braked swivel castors. UNI-FLEX™ conveyors are easily stored as they can compact to just one third or less of their extended length. UNI-FLEX™ increases materials handling efficiencies in loose loading/unloading of vehicle trailers by up to 50%, offering rapid return on investments. Easily moved and relocated for multi-door applications (unlike telescopic boom conveyors). Large, welded steel handles, powder coated in Yellow, provide positive grip points for safe and easy manoeuvring of conveyor. Side plates manufactured from high quality, bright zinc plated steel plate with ribbed design to ensure maximum strength and durability. Fully bolted design – not riveted. 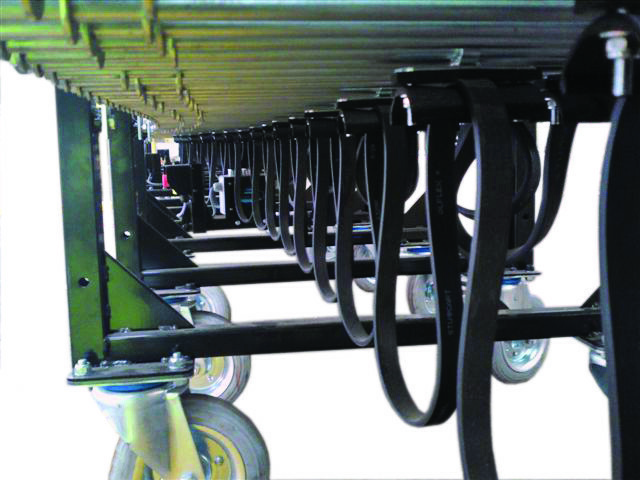 Skatewheel Axle Support – jig welded and spanning the conveyor width, our one-piece “Constantly Vertical” all steel skatewheel and axle support ensures maximum strength throughout. Meets all requirements of Manual Handling Legislation.